This richly-gilded and enamelled crucifix was part of the treasury of Basel Cathedral, and was probably displayed with other precious objects on the high altar during important feast days in the Christian calendar. When not on display, it was stored securely out of sight in a cupboard. There is no record of the circumstances under which it entered the treasury of Basel Cathedral. 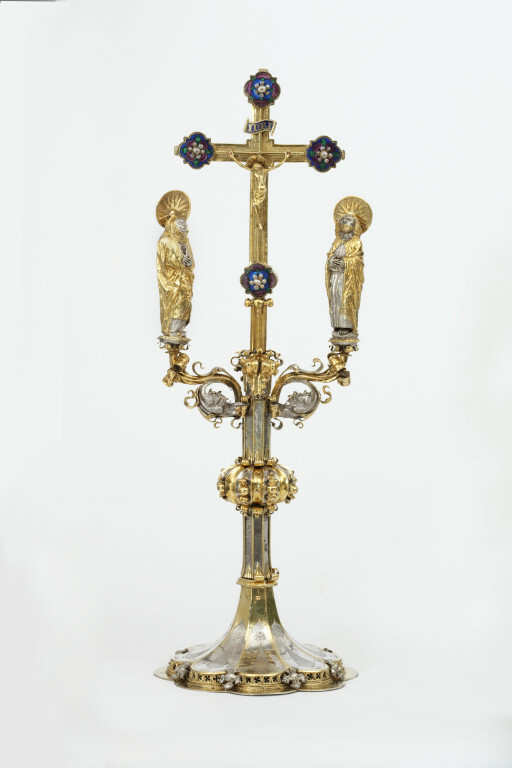 The small figure of Christ suspended from a simple gold cross formed the original nucleus of this devotional object, which was made by an unknown goldsmith, probably in the Swiss city of Basel. A 1477 inventory of the Cathedral treasury describes 'a pretty silver cross with two figures, that is to say of Mary and John'. It is possible that the added foot and figures of the Virgin Mary and John the Evangelist were made in Basel by the goldsmith Hans Rutzenwig. The style of the figures recalls a standing figure of the Virgin Mary which he made in 1488 for a monstrance now in Porrentruy (Canton Jura). The inventory also records that the base of the cross was paid for by monies received for indulgences. Indulgences were documents sold by the Catholic Church which supposedly had the power to reduce the time spent by an individual in purgatory (the state suffered by a Christian soul before it entered heaven). Church reformers condemned this practice of speeding up salvation as dishonest and corrupt, but despite this it was a popular way for the church to generate revenue. The compartments on the reverse of the cross, a later alteration, probably held relics, although there is no record to identify what they were. The worship of relics was also condemned by reformers as superstitious, but their circulation and sale provided another lucrative source of income for the Church. It is possible that once the cross had been altered to become a reliquary, it was taken on procession through the Cathedral on particular feast days. 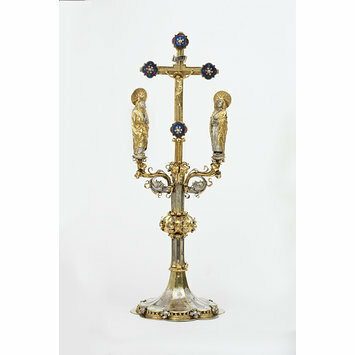 Gilded silver crucifix with cast figure of Christ, engraved and set with quatrefoils of enamel and pearls. The base raised, engraved, chased and partially gilded silver, with cast, chased and partially-gilt silver figures of the Virgin and Saint John the Evangelist. The back of the cross is formed by four hinged covers engraved with flowers. Abbreviation for 'Iesus Nazarenus Rex Iudaeorum' -- 'Jesus of Nazareth King of the Jews' (see John 19.19). In 1836 it was sold at auction in Liestal and acquired by the Basel goldsmith Johann Friedrich II, who later sold it. The cross and its base eventually entered the collection of Prince Peter Soltykoff, a collection dispersed at auction in Paris in 1861. It passed thence to the dealers Webb of London and in 1862 was acquired by the South Kensington Museum, London, later the Victoria and Albert Museum. See Husband, The Treasury of Basel Cathedral, cat. no.14, p.60. Historical significance: This type of crucifixion iconography, in which the cross bearing the crucified Christ is flanked by the figures of Christ's mother, Mary, and his disciple, John, is an ancient one dating back as early as the eighth century (see 'Archaeology of the Cross and Crucifix', in The Catholic Encyclopedia, www.newadvent.org). The presence of these two figures is explained by a passage in St John's Gospel, which records that Jesus's final command was to entrust John with the care of his ageing mother Mary (see John 19.25-27). The earliest surviving inventory of the contents of the Basel Cathedral treasury dates from 1477 (see Husband, The Treasury of Basel Cathedral, no.viii, p.44). It describes the precious crosses, reliquaries and monstrances that were displayed on the high altar of Basel Cathedral during solemn church festivals (such as Christmas and Easter). The inventory includes an entry for a cross which almost certainly corresponds to the one now in the V&A: 'a pretty silver cross with two figures, that is to say of Mary and John' (the original text cited in Burckhardt, Der Basler Münsterschatz, pp.233-8 and 361). When not on display as both tribute to, and demonstration of, the glory of God, the cross would have been locked away. The inventory also records that the base of the cross was paid for by monies received for indulgences. Indulgences were documents sold by the Catholic Church which supposedly had the power to reduce the time spent by an individual in purgatory (the state suffered by a Christian soul before it entered heaven). Church reformers condemned this practice of speeding up salvation as dishonest and corrupt, but despite this it was a popular way for the church to generate revenue. The compartments on the reverse of the cross, a later alteration, probably held relics, although there is no record to identify what they were. The worship of relics was also condemned by reformers as superstitious, but their circulation and sale provided another lucrative source of income for the Church. It is possible that once the cross had been altered to become a reliquary, it was taken carried through the Cathedral on procession during particular feast days (see Husband, The Treasury of Basel Cathedral, pp.20-22, for examples of treasury objects being treated in this way). Silver parcel-gilt with enamels and pearls. Basel (? ), the crucifix about 1350, the figures and base 1464-1474, Hans Rutenzwig or his workshop. Brigitte Meles. Astkreuz mit Maria und Johannes. In : Der Basler Münsterschatz. Basel: Christoph Merian Verlag, 2001. Cat. no.24, pp. 98-100, ill. Catalogue of the exhibition held Historisches Museum Basel, 13 July - 21 Oktober 2001 and at the Bayerisches Nationalmuseum, Munich, 1 December 2001 - 24 February 2002. ISBN 3856161422. Husband, Timothy, with contributions by Julien Chapuis, The Treasury of Basel Cathedral. New York: The Metropolitan Museum of Art and Yale University Press, 2001. cat. no. 14, p.60, ill. Catalogue of the exhibition held Metropolitan Museum of Art, New York, 28 February - 27 May 2001. ISBN 0300088493. Burckhardt, Rudolf F.. Die Kunstdenkmäler des Kantons Basel-Stadt - vol.II: Der Basler Münsterschatz. Basel Birkhäuser & cie, 1933. Thoby, Paul. Le crucifix des origines au Concile de Trénte: étude iconographique. 2 vols. Nantes: Bellanger, 1959 and 1963.